Edcampct is the first unconference I've been to. I've always believed my coworkers that these are amazing, and I'd yet to experience it for myself. Boy were they right. Before the board filled up with workshops/talks that people were going to lead, I was wondering, "What if the board stays empty?" Again - WRONG! There were incredible choices to be found and the thing that I was most surprised by was that they were all RELEVANT. And once the conversations began in the rooms, each participant's background was revealed. Those who were the experts fielded questions from the novices, and the same experts collaborated with each other to give ideas. The instruction was differentiating itself! This was collaborative learning at its best. The first session I attended was about using Google Forms to flip the classroom. What wonderful ideas for pre-assessments, assignments and post-assessments. I show my students how to use Google Forms to put together their own surveys and charts but I had no idea how broad their use was. I definitely have to go back and do some research on how to filter responses - that looked amazing. The second session was one that I led with two women from my cohort on Gender Issues in Technology. I was nervous that we would sound like 'man-haters' with an agenda, and hopefully that was not the case. The discussion was excellent, and it was great to have members of the Ethel Walker School present to discuss how they empower girls in STEAM fields. Third was the session on using Touchcast for the Flipped Classroom - again, relevant and immediately useful! This would be a great tool for days that I happen to be out - leave the touchcast on my blog, have the students watch and then use forms to answer questions or go on to a related activity of their own. Project Based Learning - or if you're up-and-coming - Inquiry Based Learning came next. Again I marveled at the expertise present; these people were giving away their secrets! And then I realized, AGAIN, that this is what it's all about. Collaboration. Networking. Sharing. Finally a group of us from UNH hosted an open discussion on an Internet Bill of Rights. People were genuinely interested and much more impassioned than I thought. The dialogue was fantastic and interesting and it was a good reminder that if this Bill of Rights is going to be written for all citizens then we need to make sure we take all citizens' viewpoints and intentions into consideration. I don't think it's an overstatement to say that after attending this conference, I cannot go back to teaching the way I was teaching before. The ideas discussed were relevant and could be immediately implemented. More than that was the model upon which EdcampCT was based: collaborative learning, constructing knowledge from everyone's experiences and creating inquiry based sessions to motivate, challenge and empower teachers. I'm looking forward to working with @PetroskiLindsay and @jluss in putting together an Unconference of our own for Regional School District 13. Networked Learning Project - I Did It! I'm training (kind of) for a 25 mile bike ride on September 6, 2014 to raise money for Smilow Cancer Hospital at Yale-New Haven Hospital. I thought I should probably have some bike repair know-how, but it wasn't until I got a flat tire in the middle of a 10-mile ride (by myself with no tools!) that I realized I needed to get serious. I used Internet searching to find videos and resources that would show easy, step-by-step instructions. My first "ah-ha!" moment came when I realized I didn't know 1) how to remove a bike wheel and 2) the actual parts of the tire. There's a tube inside!!! Whaaat? I also had to buy tools! The videos were great, and the step-by-step websites were fantastic, too. I also made sure I asked any questions I had when I bought the materials at the bike shop, just for clarification. I would definitely use this approach to learning again. I might feel self-conscious asking the same question of a live human being 25 times, but I would be just fine rewinding and replaying the same video segment 25 times. I would certainly advocate this approach to students - they might be ahead of me here, as I believe all of the Rainbow Loom bracelets they created last year were self-taught designs using YouTube! The real world is full of reasons why Networked Learning is a wonderful integration and application of technology. It is meaningful, applicable, and can be, as we've seen with bracelets, duct tape art, etc, a real motivator. Anyway...I successfully changed a road bike tire tube! Woohoo! My video has an entire outtakes reel since I made so many mistakes. My daughter and I had a lot of fun filming and shared a lot of laughs. Enjoy! 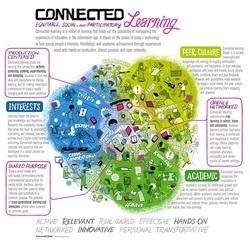 Connected Learning at its core is not about promoting a specific technology or resource, but is a model of learning that fuses interests, academics, and experiences with hands-on production, shared purpose and transparency. By drawing on the power of today's technology, Connected Learning can produce lifelong learners, higher-ordered thinkers, powerful content and connections between school, home and community. Charles Raben, in the video below, demonstrates Connected Learning through his love of photography. By going out into the community, asking questions, advocating for change, and engaging with others around him, he makes connections and facilitates change based on the sentiment of a shared purpose. He says, "I like to take charge of my own learning," and notices that the system around him is comprised of myriad components. He notes, "when you take away the components, the system fails." This observation is analogous to the idea of Connected Learning: all of the pieces fit together to create a successful learning model. Charles Raben, 9th Grade Student at Quest to Learn from Institute of Play on Vimeo. While these are universal principles, they can be applied to the technological changes of the 21st Century. The success of a honey bee hive depends on many factors, one of which is the successful orchestration of a working collective network. Each bee has a job that must be done in order to ensure survival of the hive, which takes the form of production of brood and honey. From the time a worker bee emerges from its capped cell, it is learning from its hive mates. They communicate through their intricate dances, odor plumes and even have shown to create their own cognitive maps. 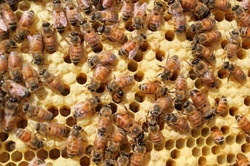 The workers may engage in honey sealing, drone feeding, attending to the queen, building honeycomb, packing pollen, fanning, acting as morticians, carrying water, and foraging for nectar. All of these worker bees performing all of these tasks in perfect synchrony. They may alternate tasks or focus on one; most engage in foraging for the last 20 or so days of their lives. You could apply the function of a bee hive to a Personal Learning Network: individual branches of input and output functioning together for a common purpose. By working collaboratively, people can share knowledge, offer and receive support and develop new knowledge. Much like the honeybee, we thrive as professionals when our Personal Learning Networks are fully functional. We rely on the many branches of our network to play various roles in our own learning and development. Where this metaphor falls apart is clear: the honeybees hardly ever get it wrong, and they are incredibly consistent. The fanning bees always fan just the right amount of water out of the nectar, and the honey sealing bees never cap honey cells before the water content reaches 20%. Sloep & Berlanga (2011) emphasize in their writing of "Learning Networks, Networked Learning," that profiling, vetting and trust formation must take place at the individual level in order to ensure that one's Learning Network and its components are trustworthy. In a previous blog post, I questioned how I should go about framing my online identity. Do I stick with the crazy bee lady theme? Or do something a little more formal and professional? Could I do both and still be credible? At this point I think it's okay to include all of the above with an awareness of my audience in each of the outputs I use. Facebook is mostly family and friends from high school, college, and my kids' friends' parents. I don't need to link my blog posts or educational technology musings there. Twitter is mostly my academic/teacher comrades and groups, so I can post links to blog posts and retweet from my incoming base if information. Google+ is my cohort traveling along this same journey, so I won't post personal 'stuff' there like I would on Facebook. My blog followers are....well....do I have any? Hmmm. What do they want to read about? The Gliffy I put together looks as all-over-the-place as I feel right now about my Personal Learning Network. I have a lot more inputs and outputs than I had on July 1 of this year. The ITDML program added so many new contacts, ideas, groups, feeds and resources to my already existing, albeit narrow, PLN. I am finding that I am contributing more within my PLN and curating information as I continue to sift through it. As I continue to create and curate my digital identity, I wonder if the arrows will calm themselves down a bit. Perhaps I will streamline the method of input/output so my time isn't split between so many sources and individual social networking tools. Robert Scoble mentioned the creation of Twitter lists and using Flipboard to build and vet the inbound content one chooses - I think investigating those would be a worthwhile next step. It may be that I collaborate by nature because I am one of four children. If things were going to go smoothly at home (and by that I mean with mom) then we needed to work together find some fun - outside, preferably. The kids next door had a really cool bat and could always find their baseballs in their garage. We had a big flat backyard with trees strategically placed at first, second and third bases. It wasn't fancy - we could not compete with the major leagues - but it suited our purpose and met our (and mom's) needs. Teaching in public education requires a lot of the same collaboration and remixing of materials. I often find myself asking teachers their opinion on my next topic or unit and I definitely repurpose unifix cubes and use them as Bingo markers. In most of the places I've worked, teachers freely give copies of their own homemade materials to their colleagues. Georgia created a first day of school PowerPoint? She shares it with her team in case they'd like to use it. Maureen developed a new teambuilder for her class? She leaves a copy of it on the faculty room table. Sometimes egos are involved and people want credit; other times not so much, because it is for the common good. When we are working toward educating our students - ALL students - I believe it is clear that the more unrestricted we and they are, the more meaningful learning and teaching will be. Remixing happens every day both in small scale proportions and larger, theoretical arenas. As Kirby Ferguson said in his TED Talk, everything is a remix culture. We are constantly building on the works of others. We can draw parallels to O'Brien's 2001 work, "At Risk Adolescents," where he states that all students are "capable and innovative with an unrestricted definition of literacy." If we remix our teaching approach so that it includes multiple literacies - text, video, images, sound clips, etc. we are remixing in valuable, meaningful ways. Regardless of what you call them - Personal Learning Networks, Personal Learning Communities, Communities of Practice - the idea is basically the same. What and who are the tools, systems and environments that you as an individual use in order to acquire, synthesize and disseminate your own learning? The thumbnail web above and the larger image below were created with a free online app called "Gliffy," which easily creates flow-charts and diagrams that can be saved using Google or Facebook accounts. The user interface is seamless and very intuitive. The diagram shows my interpretation of how PLNs work at the theoretical level. Each individual is at the center of his or her own learning environment. 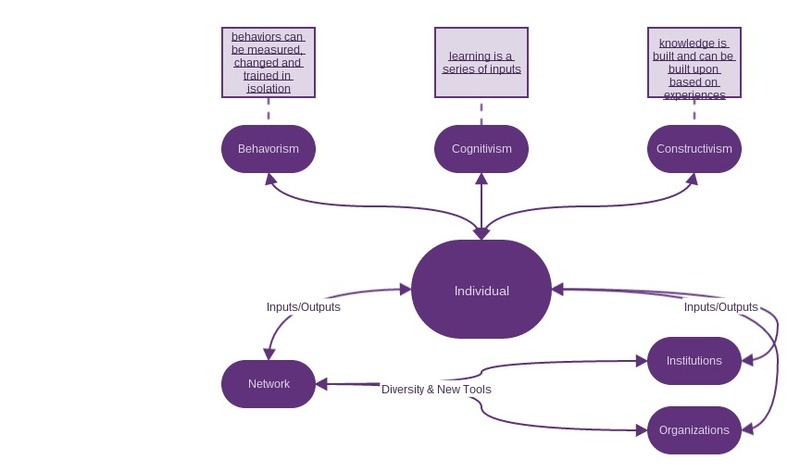 We are influenced by different theories of learning, from Behaviorism to Cognitivism to Constructivism. How we learn is unique to each individual. As digital learners, we have various inputs and outputs. For our inputs, we choose whose feeds we will follow on Twitter, we filter whose opinions and ideas we internalize at staff meetings, and we choose which news stations we tune into and which we refuse to even mention. Our outputs reflect our inputs - we post, pontificate and discuss in myriad online environments a filtered version of what we have read, listened to and processed. These inputs and outputs are constantly changing and evolving as we add, delete and go back to our network sources again and again (thus the double-sided arrows in the diagram). By connecting with sources outside of ourselves and then using our own unique processing abilities to synthesize the information that we take in, we see that even our own learning styles and approaches change. We are choosing how we learn and with whom we learn, because "nurturing and maintaining connections is needed to facilitate continual learning," (Siemens, 2004). Part of the adventure in blogging is discovering or choosing my voice. Who do I want to be known as? Steve Rosenbaum asks, "Who am I going to be today?" Via social media we have multiple platforms on which to stand, multiple soap boxes from which we can pontificate. The question I am left with is, when we mix our voices in the context of social media, do we diminish the efficacy and credibility of our viewpoints? My Facebook profile, Twitter feed and Blog posts all reflect this 'multiple personality' and I'm trying to figure out a way to cultivate it and make it work. I had the good fortune of having my TPACK blog post retweeted by researcher Matthew Koehler a couple of weeks ago. I felt like my professional voice was being shared and validated. I thought, "Wow, I worked hard on that and someone thought it was valuable enough to retweet. He has 693 followers! They might actually see or even - maybe it's a stretch - read my work!" Does it completely invalidate my intellect and ability and interest in educational technology if I then retweeted Jenny Lawson's tweet depicting the taxidermied racoon wearing a vintage woman's hat and eating a box of Nilla Wafers that appeared in her Post Office box that afternoon? Some may say yes. I will continue to ask these questions - and more - as I continue to cultivate my online identity. I want to be credible, respected, and seen as a curator of information. Do I choose one self? One identity? Or is it possible to embrace and share multiple identities and interests and still be taken seriously?